Does that sculpture above look familiar? Do you feel like you’ve seen some others like it? If so, then that bell is ringing for the right reason. This particular sculpture stands right outside of city hall. Here’s your chance to find out who created it and what his inspiration was for sculpting it. 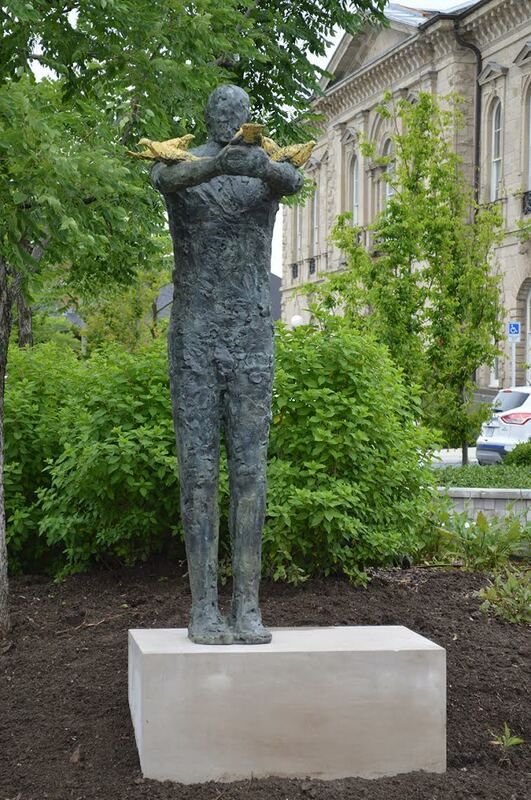 Join us at Guelph City Hall (located at 1 Carden Street) from 7:00 to 8:00 p.m. to celebrate the city’s newest public art and meet artist Ted Fullerton! Starting at Market Square, Ted will lead a guided tour of four new works of art (like “Birds of a Feather” photographed above) and share the stories behind their creation. Fullerton’s body of work possesses undercurrents of human emotion and mystery. Many of his explorations have dealt with themes and myths revealing his concern with spiritual and magical worlds. For Fullerton “mythic symbols are entry points to the unconscious.” Through these devices he investigates the duality of human nature, the tension between the rational and the illogical, the physical and the spiritual, the intellectual and the intuitive. Whether he is working in oil, printmaking, sculpture or mixed media drawing, in intimate or monumental scale, Fullerton’s creative process is spontaneous and gestural with sensuous and bold texture, line and movement. Fullerton has exhibited his sculptures, prints, and paintings in Bao-Xi Gallery in both Vancouver and Toronto, Ferneyhough Gallery in North Bay, Seattle’s Foster Gallery, Monnow Valley Arts Centre in the UK, and Wolseley Fine Arts in the UK. This entry was posted in Art, Fourth Fridays and tagged downtown Guelph events, Fourth Friday events, Guelph art events, Guelph events by Fourth Friday. Bookmark the permalink.